After the birth of our second son, I found myself in the difficult season of postpartum anxiety. At one point during that period, a dear friend of mine suggested I listen to the Risen Motherhood podcast. Although I had never heard of Risen Motherhood, I was anxious to look it up and give it a listen. I was immediately hooked. The truths proclaimed weekly on the show so deeply resonated with all the struggles I was feeling as a mom of two little ones and regularly reminded me to run to Christ with all the overwhelm I was feeling. Supporting Risen Motherhood is a way that my family can help other moms who may be struggling with similar feelings of guilt and fear. I am so thankful for the ways that this podcast has redirected my attention to the gospel, over and over, and I want all moms to experience the same type of freedom in mothering that I have through Christ! I am a mom of three (5, 3, and 2) with a husband who works very long hours. One of my dear friends suggested Risen Motherhood to me over a year ago. When I started listening, it was like fresh water to my thirsty soul. As I binged every episode, motherhood began to have more meaning beyond just changing diapers and fixing snacks. Through this podcast the Holy Spirit has done a mighty transforming work in me as a mother and as a believer, even in mundane tasks. I chose to support this ministry financially in order to spread the Good News of Jesus to women and mothers all over the world and to offer encouragement for women in the season of small children. I share it with anyone I get the chance. Thank you all for following the call to share the "refreshing news of the gospel...over and over to give us hope in the everyday moments." This is probably too long but I just want y'all to know how thankful I am to have been led to this podcast. I wish I know each of you personally! I feel like we are friends! I support the Risen Motherhood ministry because it has been so influential in shaping my motherhood and my walk with the Lord. I started listening to the podcast shortly before I became a mom, and I was so grateful for a ministry that points moms to the hope of the gospel. I love that Emily and Laura cover such a variety of topics on the show and how they bring it all back to the gospel. Their approach has really helped me to be able to apply the gospel to everyday situations in motherhood and the rest of life. One of the things I most appreciate about this ministry is how much it encourages moms to get in God’s Word. It truly is our source of life and strength, and I so appreciate that while the RM team does share practical tips and resources, they are constantly encouraging us to go to the Word and to let that be our starting point always. This ministry is a breath of fresh air in our culture today, and I have been so grateful to be able to support the ministry in this small way. The Lord has used the RM podcast to speak life and truth into this weary momma’s soul. I have been able to engage with the Biblical narrative in new ways and truly see how the Gospel applies and brings hope to areas of motherhood and life that I never considered before. The resources provided on the show and through the website are invaluable to me and I feel better equipped to teach my children to know and follow Christ. Risen Motherhood has filled an integral gap in ministry and my family and I support them in the hopes that other young moms around the world can experience the same hope and encouragement. God led me to a mom’s group in my church when I had three kids under three years old and was working full time. It met twice a month and was an oasis for my parched soul; Learning I wasn’t alone and that God is in the details of every moment of my long, repetitive and often overwhelming days at every meeting. It was a steady stream of truth that sustained me. This is exactly what Risen Motherhood has been in my earbuds! It always saddened me that I couldn’t bring every mom I knew to that group. Now I have that opportunity through this podcast! This podcast has so much rich truth and yet it is full of practical guidance. The down-to-Earth style of Emily and Laura, deep truths and teaching are formatted in a way that is easily consumed and fun. It was sad when I became “caught up” and couldn’t listen to new episodes any time I wanted! I chose to donate because of the strong mission and intensely Gospel focused content of this podcast. I have listened to other podcasts with commercials and they lose focus and momentum. The biggest reason I chose to give was to keep them from having to bring in ads. This podcast and ministry are desperately needed in this culture we are living in. I am a walking commercial for Risen Motherhood on a daily basis! God gets all the glory! Being a woman who has longed for motherhood her whole life, you would assume I would listen to Risen Motherhood (RM). About a year ago I realized that becoming a mother was not going to be easy. I still am not a mother. Some days that can be hard. RM has continued to be a great encouragement. I chose to subscribe and support this podcast because of the mission to have gospel-centered motherhood. I long to be a mother that loves God and passes that on to my children in an intentional way. I knew that was something I should prepare to do, but I did not know how. This was a starting point, and a great one at that. As I have come further, I see this podcast as much more. It has helped me learn to encourage mothers around me with a gospel light. I see it reshaping how I approach relationships with children around me. RM has poured more into me than I thought it could at my current stage. Thank you to the RM team for their dedication to making every aspect of their organization gospel-centered. I chose to financially support RM because I completely believe in and agree with what Emily and Laura are promoting. Learning how the gospel impacts every aspect of motherhood has been so helpful for me! I love the stories, tips, interviews, application, honesty, encouragement, transparency, resources, and wisdom they share. I have truly grown in my walk with the Lord since listening to them! I have shared their ministry with many moms who have loved it as well :) I love their heart behind it and their desire for women to know and grow in love with Christ. Thank y’all for all that you do!!! Whoever walks with the wise becomes wise (Pr. 13:20a). The women of RM have become my weekly companions. I have been positively influenced by their thought-provoking conversations. The topics addressed are challenging, encouraging, instructive, and timely. During this busy season of motherhood I need the support of women who understand and are purposeful in how they might stir up this momma to love and good works. I cherish this ministry and support it with great joy! The ministry of Risen Motherhood is forever shaping my "mom journey" through the lens of the gospel. When I became a mom in 2016, I left my teaching career to pursue full time stay-at-home mom responsibility. I cannot express the benefit of the encouragement and personal conviction I have felt as I have listened to Emily and Laura (and their thoughtfully selected guests!). Many, many times I have found myself in a bit of a "funk" as I drudge through the tasks of the "mommy mundane," and through prayer and the ability to cling to the scriptural truths presented through the RM podcast, the holy spirit has time and again transformed my attitude of disgruntled, tired momma into that of humble, grateful servant of Christ. I am so thankful the Lord has given me children to disciple, but learning how to find my identity in Him above my motherhood status has been one of the greatest joys in His sanctification story in me. I love financially supporting Risen Motherhood because it is a tangible way to see this ministry flourish--every time one of my friends becomes a new mom, I recommend the soul nourishing RM content to them, and I pray that many hearts will be renewed, grown, and transformed through the work the Lord is doing in this precious space. I am so grateful for the way God has used the ministry of Risen Motherhood to encourage, challenge, and grow me in my parenting. 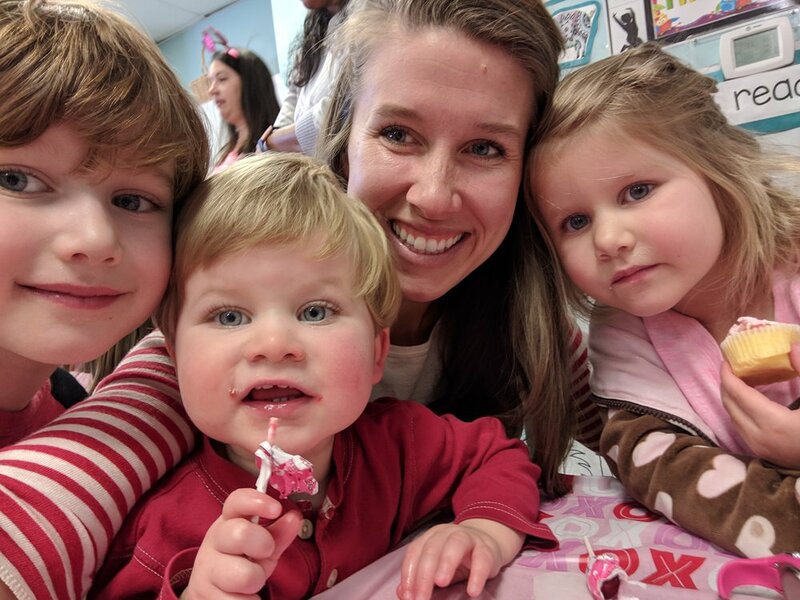 As a mom of five little ones, I struggled to connect the dots of Gospel living to the day-to-day mom life, and Laura and Emily (and their guests) do that in a Jesus-focused, fun, and uplifting way. As a result of what God is doing in my own heart, I want to tell everyone about RM! When the opportunity arose to financially partner with RM, I was thrilled to share in the joy of helping spread the Gospel of Jesus Christ to other moms. I love hearing updates on the ministry as well as know that other moms are able to grow and be changed the way I am. I pray that God would continue to bless RM and all those who read, listen, and follow as they pursue Christ! Laura and Emily feel like close friends. That's a weird thing to say considering I've never met them. They don't know me and they don't know my struggles, but it often feels like they're talking straight to me. I listened to their interview with Lindsey Carlson on postpartum depression about 18 months ago. I didn't know - until listening - that I was struggling with PPD. I had been struggling since the birth of our second child, and I'd continue to fight for the following 6 months. The difference was that I was no longer struggling in silence. I KNEW I wasn't alone and that it wasn't supposed to be this way! The conversation of PPD and the truth of the Gospel gave me the courage to talk to my husband and begin the process of acknowledging my need to get help, and eventually helped me accept that help. All the glory belongs to God and His grace through Jesus. I will always be grateful for the way He has equipped Emily and Laura and for their willingness to serve in His name. My family chose to financially support this ministry because we want other women to get the chance to get to know and feel known by the RM team. It's a blessing to partner with them in the Gospel of Christ. I joyfully support Risen Motherhood because it has been such a blessing to me as I have been starting my motherhood journey. I discovered it when my oldest son was only a few months old and have been binge-listening and practicing sharing the Gospel with him (and my younger son now too!) ever since! They hit on so many valuable topics and have helped shift my thinking framework to Creation, Fall, Redemption, and Restoration to many topics myself as I go about my day. I love having a resource to refer my sisters-in-Christ to for any number of topics as well- knowing that I am pointing them to Christ, Truth, and the Gospel with RM resources! Thank you!